Thomas Locker's outlook on life changed when he died. After being pronounced dead from a dissecting aneurysm, a nearly always fatal affliction, he came back to life and lingered in a coma for 17 days. He eventually recovered, and has since resumed his lifelong work: painting. 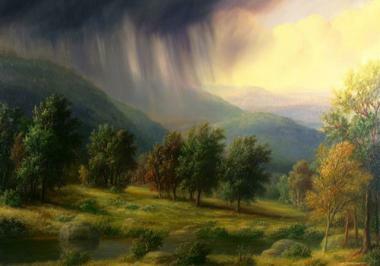 The septuagenarian painter is classified as a second-generation student of the Hudson River School, a group made famous by 19th-century painter Thomas Cole. Known for their romantic depictions of landscapes, primarily in the Hudson River Valley area, the group had an almost fanatical reverence for the raw northeastern American terrain. After his brush with death, Locker moved from the Hudson River Valley to the Catskills in order to escape urban sprawl and other problems of civilization. With the picturesque mountain range surrounding his studio, he has spent the past six years trying to perfect his painting techniques while basking in the serenity and beauty of nature. This month at Northampton's R. Michelson Galleries, Locker exhibits some dozen large-scale landscape paintings (as well as a few smaller study paintings) that represent certain themes or problems (such as painting a perfect tree in the style of Claude Lorrain) the artist has been striving to master throughout his life. Partly because of their magnitude, Locker's paintings are breathtaking reminders of the majesty of the outdoors untouched by humans. With tranquil classical music in the background, the prolific painter spoke to the Advocate from his studio high up in the Catskills between Hunter and Windham Mountains about how his life has changed, communicating with Henry David Thoreau and the process by which he creates his masterpieces. Advocate: How did you get your start in painting? Thomas Locker: When I was young, I didn't talk very much, but I drew all the time& At school on Long Island, they put some of my pictures on the walls. A painter walked through, Alberto Romano, and said, "I must have that boy." So I was apprenticed at age six to Romano. I got some of the old-world training like drawing from casts, learning how to sweep the studio—that sort of thing. I tried every which way to get out of being a painter but I couldn't, so I got a degree in art history from the University of Chicago. Why did you start writing children's books? It was an economic necessity. I thought of what Isaiah said, "And a little child shall lead them"—at the time, all of the children's books were sort of in imitation of Saturday morning cartoons. So I thought I would bring the world of fine art to children. I thought maybe I could bring art to some of the schools that no longer had art teachers. I did 36 books and I don't know how many foreign translations, and reprints have actually happened& There are some books that I'm deeply proud of, ones, I think, that made a real contribution. Some of them have become kind of classics; they're in the curriculums at schools all over the country. So in that world, I've gained a kind of fame—when I was in that coma, apparently some librarians heard about it, and they set up a prayer chain on the email thing& but I'm pretty much through with [illustrating and writing books]. I've said all I have to say. How has being pronounced dead and recovering changed your life and the way you paint? I feel like I'm living on borrowed time. The whole world is miraculous. That sense of wonder is what I try to reflect in my paintings& I have been in search of radiance and the wholeness and the glory of this world. I've been rejoicing in it and attempting to share it with others through painting. Do you remembering anything from during that time? Oh, yes. For instance, just as an example, I was working on a book about my hero, Henry David Thoreau. The book was already done and written when I had a dissecting aneurism. I woke up three weeks later and my publisher called the hospital, St. Peter's in Albany, and here's what happened: "Bob, where's the book? It's wrong," I said. "The text is wrong. It says that Thoreau followed a path by the river that led to the wilderness. Bob, he was a bushwhacker. He avoided paths at any cost. He was a river wader. He was so engrossed with the idea of being one with nature that he got into the river and waded in the water right up to his nose." My publisher said, "That's nonsense. How could you know that?" He's my editor and publisher but he also happened to be a past president of the Thoreau Society and [that information] wasn't in any of Thoreau's writing, not any of that stuff, and I had to admit that when I was [in a coma] I must have communicated with Thoreau. How did you find out it was true? Apparently there's a letter, Bob found out, from Thoreau's friend that describes the [river wading] event. So it's actually true. But how did I get that information? There's more on heaven and earth than meets my understanding. You're usually classified as a painter in the Hudson River Valley tradition, and have often been pegged as the one painter who's keeping this tradition alive. Do you identify with that? There are a lot of good painters who are working with this tradition, but I guess I've just been doing it longer. There was a generation of painters who looked at abstraction, and that's not for me. The world is the here and now& I'm teaching a lot of young people how to do this old technique. It's one of the things I do now out of a sense of obligation. The original Hudson River Valley artists were characterized by a shared belief that nature in the form of the American landscape was a manifestation of God. Do you feel the same way? There was a very powerful influence from one of my teachers, Joshua Taylor, to whom I dedicated Where the River Begins [a children's book written and illustrated by Locker]. But most of the people who I communicate with are long gone, like Rembrandt, Vermeer and [Jacob van] Ruisdael. They're my heroes, my guides. Ruisdael was a 17th-century Dutch painter, and in my mind one of the greatest painters that ever was. When you're painting landscapes, do you paint out in the elements or in your studio? I tried [to paint outside] lots of times, but you can't glaze or gild up [the painting] or anything. I'm very impatient, and one is battling the ever-changingness of the natural world—you look up and see something, and 10 seconds later it's different. It's maddening. So I bring the experiences into the studio rather than grapple with it in plein air. I certainly admire [plein air painters] but I think they're crazy& I use drawings as references for the particulars. But what I paint is filtered through the process of my memory. I've found it very helpful to wait two or three months to sort through what's important and what's not. It's nature filtered through a poetic sensibility and it's central to the way I work." Thomas Locker: An Artist's View is on display Sept. 1-Oct. 6 at R. Michelson Galleries, 132 Main St., Northampton, (413) 586-3964, http://www.rmichelson.com. Artist's reception: Sept. 12, 6-8 p.m. in conjunction with Northampton's Arts Night Out.